Columbia, Mo. (Oct. 10, 2016) — Journalists’ influence, advancing democracy and inclusion are some of the topics of this year’s Missouri Honor Medal master classes. The daylong series begins at 9 a.m. on Tuesday, Oct. 18, at the Missouri School of Journalism. All sessions are free and open to the public. The speakers, a prominent group representing all areas of journalism and strategic communication, will accept the Missouri Honor Medal for Distinguished Service in Journalism at a banquet to be held that evening. This year’s Missouri Honor Medal events are scheduled for Tuesday, Oct. 18, at the Missouri School of Journalism. 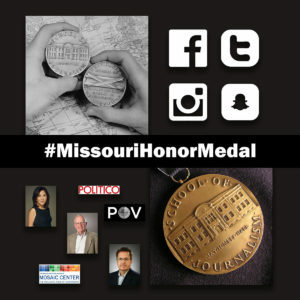 Participants in the daylong series of Master Classes and/or the awards banquet later that evening are encouraged to post photos, quotes and memorable interactions to social media using the hashtag #MissouriHonorMedal. Associate Professor Amy Simons will lead a group of medalists in a discussion. Contact the Missouri School of Journalism with questions about the Missouri Honor Medal activities.